Home→Martin Ginsberg Intros His Plan for Redevelopment of White Plains Financial Center. Renamed “City Square” Construction to Start this coming Spring. Martin Ginsberg Intros His Plan for Redevelopment of White Plains Financial Center. Renamed “City Square” Construction to Start this coming Spring. CITY SQUARE NEW LOOK TO MARTINE AVE (LEFT) AND SOUTH LEXINGTON AVENUE(OPPOSITE THE GALLERIA MALL) Rendering, courtesy GDC Development. 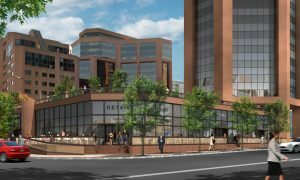 Ginsburg Development Companies, LLC (GDC) unveiled to the White Plains Common Council Monday night its vision and plans for the transformation of the former Westchester Financial Center into City Square, a new mixed-use project at the city block enclosed by Martine Avenue, South Lexington Avenues, Main Street and Bank Street. A spokesman for GDC brings the news that the project will begin construction in spring of 2019. Ginsburg will be the first developer to begin the White Plains second “renaissance,” with four other already Common Council- approved projects on hold in the White Plains downtown(The WP Pavilion rebuild; the Bloomingdale Road parking lot project, the Post Road-Mamaroneck Avenue apartment project (currently just starting demolition), the White Plains Mall project, the 440 Hamilton renovation, the Westchester Avenue apartments project, and the fate of the 4 city-owned parcels on the east side of the White Plains railroad station where proposals to be considered as developer were requested by the city a year ago. The Ginsburg project features renovation of the office space at 50 Main Street, new restaurants and retail space along Main Street and Martine Avenue, and the transformation of the 1 Martine Avenue office building into 188 units of rental apartments. Ginsburg purchased the 571,000-square-foot property for $83 million. He had earlier purchased The Metro, a 122-unit residential building at 37 South Lexington Avenue, which completes the block which will be called City Square. The transformation of Westchester Financial Center into City Square will be the first development project in the White Plains new Transit District Development Zone, designed to make the neighborhood near the train station more pedestrian friendly with new retail and restaurant offerings. The station is currently undergoing a $92 million renovation by Metro-North Railroad. “We are excited to be at the forefront in initiating this gateway project to the downtown. City Square will become a real mixed-use location in Westchester County for people to live, work, play and dine – all just steps from the new train station,” said GDC principal Martin Ginsburg. GDC unveiled renderings of the redevelopment that shows a dramatic new entrance for the 50 Main Street office building featuring a dramatic sculpture and new retail and restaurant buildings fronting Main Street, South Lexington Avenue and Martine Avenue. GDC is proposing a total of 19,540 square feet of new retail/restaurant space. Upgrades to 50 Main Street will include an entire new amenity floor featuring a completely renovated cafeteria with outdoor dining, a fitness center, various meeting rooms, yoga/motion rooms, conference/assembly rooms, art gallery, exhibit area and a golf simulator. The proposed 1 Martine residential conversion will contain 188 rental apartments offering studio, one-bedroom and two-bedroom units. Amenities in the building will include a Club Lounge with setback roof terrace, a fitness center and 24/7 Concierge Service. An amenity that the entire complex will be able to enjoy is a new “City Square Park,” an almost one-acre landscaped roof deck that will sit on top of the property’s 1,033-space parking garage and will be accessible from all buildings. This Central Park will feature a dramatic fountain with plentiful seating, a putting green, a BBQ Pavilion and a 2,000-step, 4-level walking path with landscaping and sculpture features. “City Square Park is a unique feature that will become a favored spot for all of those who live and/or work at this special place,” concluded Ginsburg. The Council will take up the project at the upcoming Common Council meeting December 3.